Scandinavian Airlines (SAS) is the biggest airline in the Scandinavian countries (Sweden, Norway and Denmark) and was struggling with an identity crisis not long ago, since they wanted to be a full service flag carrier and a low cost airline at the same time. Since then the airline introduced a new service concept. I took a flight between Copenhagen and Nice in SAS Go (Economy) recently and enjoyed it. Read on to find out what it is like. The cabin is now divided in 2 sections, SAS Plus (former Business Class) and SAS Go which is the re-vamped Economy Class. 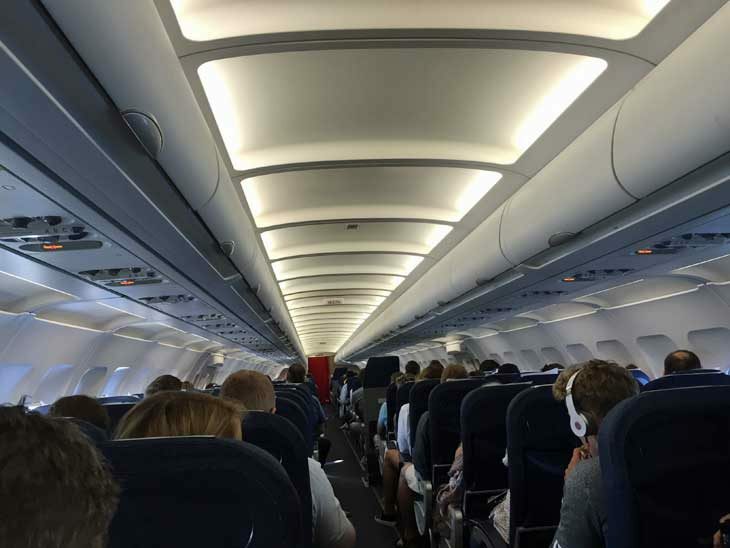 The curtain is gone and you will be in the same compartment as everyone else when flying in SAS Plus, the only thing showing where Economy starts is a little card board sign. Guess this saves lots of time and easier for the crew to handle when reconfiguring the cabin at turn-arounds. 2 pieces of checked baggage. Fast track at the airport. More frequent flier points in the loyalty program Eurobonus. Ground Services When Flying SAS Go. Booked easily on flysas.com and received a clear and proper email confirmation immediately. Downloaded the SAS app and got push notifications when check-in was available. Checked in easily using the app and just added our bags at the airport. When flying SAS Go one checked bag is included and it might not sound much, but it is usually what makes me choose SAS ahead of other carriers. I love the freedom of being able to bring a bag without being asked for more money. I am so tired of small charges here and there. It is not about the money, it is about the trouble of pulling out my credit card at numerous times on a trip and then having heaps of receipts to sort at the end of the month. Security at Copenhagen Airport was friendly and efficient even though I took my flight just days after the tragic events in Nice and Turkey. I was singled out for a random extra check, but it was handled smoothly and quickly and I was in the departure hall only minutes later than normal. Ahead of the flight I received text messages with flight status and gate information which is something I appreciate. Boarding started 5 minutes ahead of communicated time and went fairly smooth, even though it was a full flight in peak season. When seated, we waited for passengers at the gate and was pushed back about 10 mins late, which was made up for during flight and arrived on schedule in Nice. Going back from Nice we suffered delays due to late incoming aircrafts and then we waited for more than an hour to get our bags because the baggage handlers (SAS Handling) had too much to do! ?This is unacceptable, especially after a delay. You will be given a glass of water and coffee or tea for free, everything else has to be purchased. The assortment varies depending on the time of the day and in my case it consisted of breakfast dishes, since I was on a very early flight out of Copenhagen. During the flight “duty-free” was sold from a trolley. We all know that it is not truly duty free within EU but I like the service, since it gives me an opportunity to buy those gifts I forgot to purchase on the ground. I enjoyed the flight and it is a lot better than the majority of low cost carriers out there. Is it the best flight I have taken? No, but this is good enough. 3 points out of 5. What do you think of SAS Go? Please let me know via email, in the comments below, on Twitter, Facebook or Google+.